There is an account of his calling (Matthew 9 v9) “Jesus left that place, and as he walked along he saw a tax collector, named Matthew, sitting in his office. He said to him, “Follow me.” Matthew got up and followed him.” There appears to have been no hesitation! There is a tradition that after his calling, Jesus gave him the name Levi. Saint Matthew gave a feast in Christ's honour and the guests were drawn from among his friends—including fellow tax collectors and sinners (Matthew 9:10-13). The Pharisees objected to Christ eating with such people, to which Christ responded, "I am not come to call the just, but sinners," summing up the Christian message of salvation. 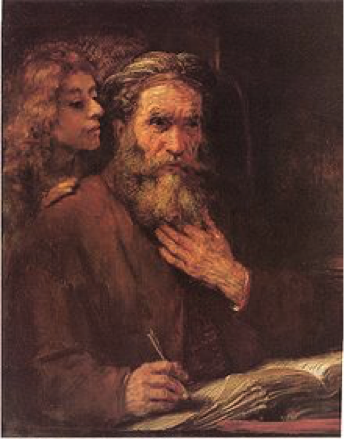 It is a matter of debate whether Matthew actually wrote the Gospel which bears his name, but he would have been literate in both Greek and Aramaic. Matthew’s Gospel was written to convince a Jewish reader of the validity of Jesus as the Messiah and it values tradition and is written in an orderly and structured manner. Interestingly in a Sura of the Qur’an, Matthew is recognised as one of the disciples of Jesus. We thank thee, heavenly Father, for the witness of your apostle And evangelist Matthew to the Gospel of your Son our Saviour; and we pray that, after his example, we may with ready wills and hearts obey the calling of our Lord to follow him; through Jesus Christ our Lord, who lives and reigns with you and the Holy Spirit, one God, now and for ever.